During my college years, when I was majoring in Music Business with a Recording Engineering concentration, I asked my beloved grandfather, a gifted raconteur, if I could record him telling stories about our family’s history. He was approaching his mid-70s by then, and perhaps deep down I sensed we didn’t have a ton of time left. Regardless, the stories he told that day had a huge impact on my life. Fast forward seven years: My grandfather had passed away after losing his battle with lung cancer, I had fallen in love with Scottish history and culture (fueled in part by films such as Braveheart and Rob Roy), and my career as a freelance writer had taken off. So I was ecstatic when Twentieth Century Fox invited me to attend a press junket in Scotland for the film Entrapment. I would be flown to Edinburgh, stay in the historic Caledonian Hotel, attend the film’s world premiere, and interview stars Sean Connery and Catherine Zeta-Jones. As a longtime Connery fan, I couldn’t have been more excited. So excited, in fact, that I didn’t sleep a wink on the red-eye from Atlanta to Scotland, and therefore arrived in Edinburgh in the middle of a beautiful morning restless yet ready to roam. I had only one day free, and I intended to make the most of it. After checking in at the Caledonian (which was built in 1903 and sits in the heart of the city, providing stunning views of Edinburgh Castle and Princes Street Gardens) and grabbing a quick shower, I set out to walk the city’s famed Royal Mile. I started off at the Castle, which has been in use for over 1,000 years and was an official Royal residence for centuries. 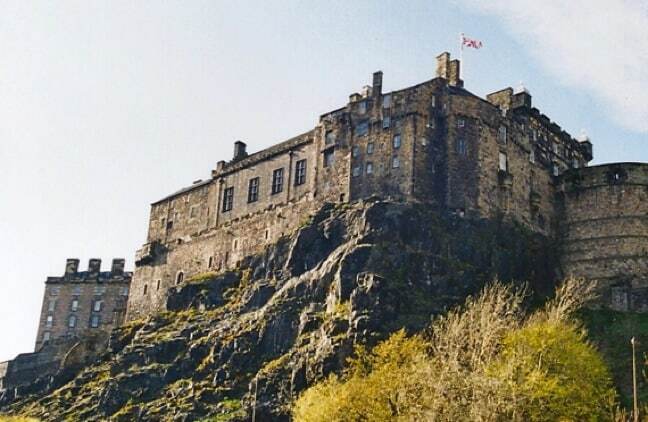 Standing high above Edinburgh’s Old Town area, the formidable fortress includes a museum in the Palace, bronze statues of famous Scotsmen such as William Wallace and Robert the Bruce in the Gatehouse, the Witches’ Memorial monument (where more than 300 women were burned at the stake), Mills Mount Battery (where a cannon is fired at 1:30PM 6 days a week), and Half Moon Battery (which protected the castle’s vulnerable eastern side). Exploring the castle for a few hours provided an immersive overview of Scotland’s proud, bloody history. 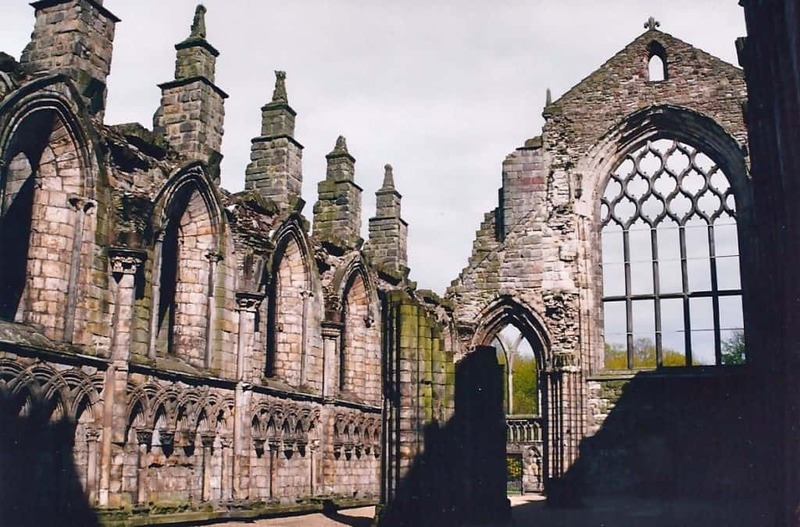 From there, I gradually made my way along the Royal Mile, which extends from the top of Castle Rock down the city’s main thoroughfare to the ruins at Holyrood Abbey. 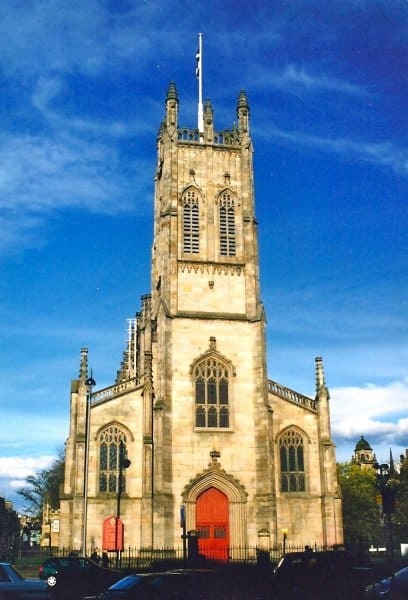 Historic sites along the way are many, including the Tron Kirk (a church built in the 17th century), the Canongate Kirk (the church founded in 1688, where the Queen’s granddaughter was married last year), the Heart of Midlothian, the General Assembly Hall of the Church of Scotland, and the Palace of Holyroodhouse (once home to Mary, Queen of Scots, and still used by the Royal family today). Along the way, I stopped in to buy an antique chess set, have a bite of traditional fish ‘n’ chips, and listen to a bagpiper busking for spare change. 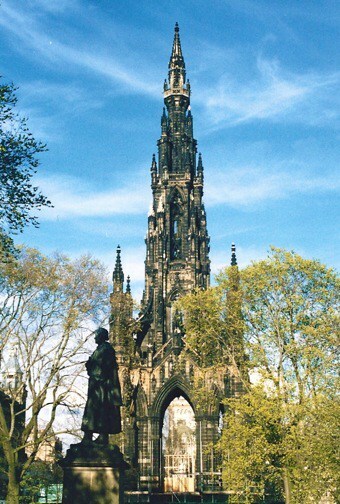 By the time I got back to my hotel (walking through Princes Street Gardens to visit the 200-foot tower of the Scott Monument, created in 1846 to honor author Sir Walter Scott), the sidewalk was crawling with paparazzi. Apparently word had gotten out that Sean Connery was staying at the Caledonian as well, and at the time the outspoken actor was at the center of the controversy surrounding Scottish independence. The energy was palpable, so I was buzzing by the time I got on the bus for the movie screening, despite not having slept in over 24 hours. The screening of Entrapment was held in some grand historic theater whose name escapes me. What I do remember was the feeling of walking into this massive venue (which must have held at least 2,000 people) to find that the 25 journalists were the only people there. Usually our press screenings were packed with the movie-going public, whose energy the studios hoped would lead to more favorable critical response, but this time the place was virtually empty. Then, shortly after the credits rolled, I heard voices a few rows behind me: When I looked back, there sat Sean Connery, Catherine Zeta-Jones, Michael Douglas and director Jon Amiel, sneaking into seats in the back row of the auditorium. The film was mediocre (expect for Zeta-Jones’ memorable scene in which she moved through lasers in the sexiest way imaginable), but I didn’t care: I was in Scotland, and I was having a blast. After the movie, we had dinner in a private room on the castle grounds. It was there that I had the traditional dish known as haggis for the first time (and loved it! ), and also where I had my first taste of 30-year-old Scotch (make mine a double!). As we ate, a storyteller regaled us with dark tales from the annals of Scottish history, and I began to understand how brutal and bloody my ancestors had been. Afterwards, I went on a late-night walk with Auld Reekie’s Ghost Tours, exploring Edinburgh’s famed underground vaults and hearing macabre tales of Mary Kings Close, Mercat Cross, grave-robbers, cannibals and more. It was awesome, like an episode of Game of Thrones brought to life through storytelling. The next day started early, with more haggis for breakfast (as well as blood sausage, another culinary first for me). I was disappointed to learn that we’d be interviewing Connery and Zeta-Jones together, and even more disappointed to see that Zeta-Jones was not quite as attractive up close as she was onscreen. But Connery was everything you could hope for in an interview– proud, outspoken and open to discussing everything from his legacy as James Bond to why he was willing to fight for Scottish independence. Afterwards, I had a few hours to kill before catching my flight to London for the world premiere of Notting Hill. I decided to take a quick cab ride back up to the entrance to Edinburgh Castle in hopes of getting some good photos. As I stood in the parking lot trying to get a good shot, a tour bus pulled up and a group of tourists swarmed onto the sidewalk. Leading them was a tall, sturdy, bearded man in traditional tartan kilt. My jaw dropped as I recognized him: He was the spitting image of my late grandfather! I was so emotionally overwhelmed I didn’t know what to say, so I simply asked him if he’d mind posing for a photo in front of the castle. He graciously obliged. When I got home and showed my grandmother the photo, she immediately burst into tears, sobbing and smiling at the realization that her beloved husband had a doppleganger who was alive and well and living in Scotland.